Today I wanted to share two of my favorite hair products! So I have a lot of hair. It’s pretty long and it’s thick and there is just a lot of it and it’s always everywhere. My sister is a hairstylist so of course I’m always getting my hair done and different. I’ve been dark brown, blonde, red, brown again, blonde again, now red again, it’s an endless cycle of change but I love it. Bleach though, seriously dries out your hair. When I was blonde and even awhile after I was no longer blonde, I couldn’t brush my hair when it was wet. It would just break off in my brush and was SUPER tangly. One day my stepmom came home from the salon my sister works out and handed me a brush she got me. It’s called the Wet Brush. It looked like a pretty standard brush but she said its supposed to work really well with wet hair. Well that night after washing my hair I tried it. It was like MAGIC. It went through my hair like nothing! No hair broke off and no tangles! I was so amazed. How does this thing work?! Well it has special flexible bristles that just go through your hair without pulling it. I’ve been using it for three years and can’t even use a regular brush now. I tried and it hurt. There really is a difference. I finally just bought a new one and it’s PINK! 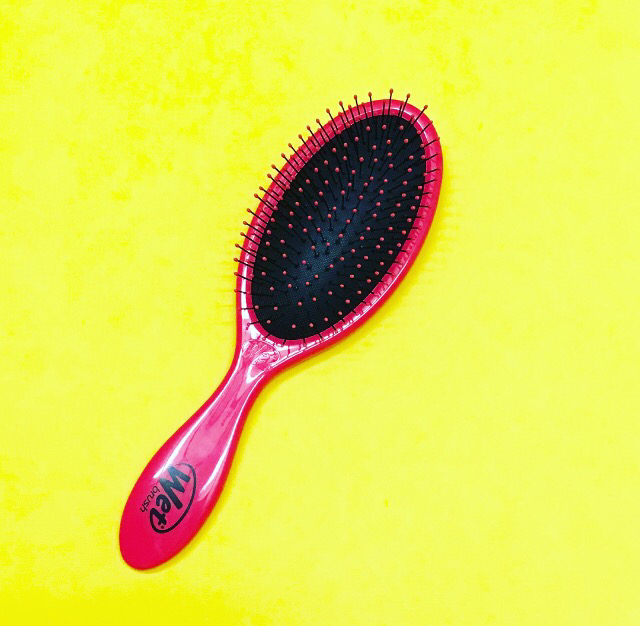 If you have trouble with detangling your hair I HIGHLY recommend this brush! I refuse to use any other brush now. It’s also great for kids! My sister uses it on my niece and there are no tears! I got my new one at Target and it was only $8.99! 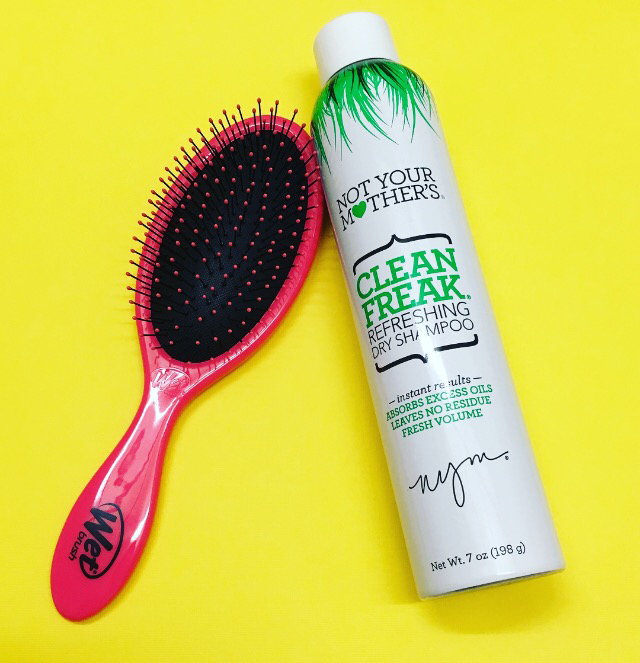 My second hair favorite is Not Your Mother’s Clean Freak Refreshing Dry Shampoo. Come on girls, who doesn’t love dry shampoo? There is usually one day a week that I just dry shampoo my entire head. Sometimes you just don’t want to wash your hair and mine takes forever to dry so if it’s late and I haven’t washed it yet, then I’ll just dry shampoo the next day. The last dry shampoo I tried started off good but within a couple hours my hair just looked greasy again, and by the end of the day it looked really bad. The next time I tried this one and it worked great and it smelled so good! It totally lasted all day, even when I had to use it on my entire head. 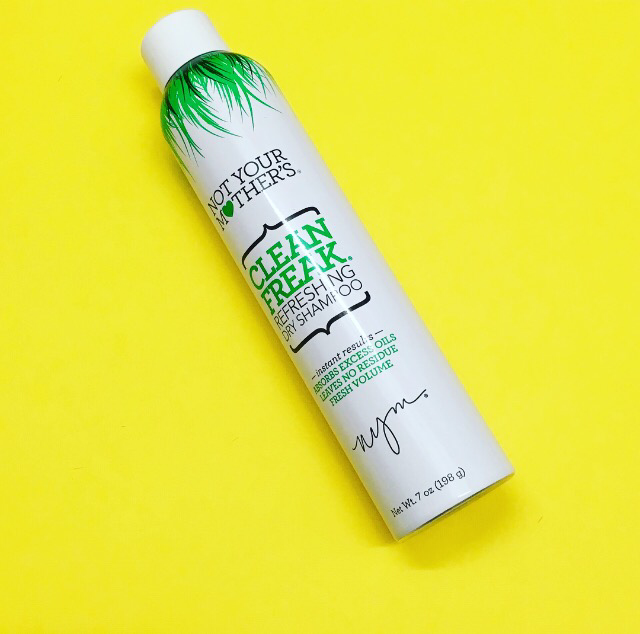 You can get the Not Your Mother’s Clean Freak Refreshing Dry Shampoo at most stores. I got mine at Target this last time but before that I even bought it at Vons! The best part is that it’s only $4.79! Shop both of these products at Target here! Browsing Instagram the other night I noticed one of the bloggers I follow had on super cute heels. Going to her blog to research them I found that they were Steve Madden. Perfect! Steve Madden is my favorite. I looked on Macy’s and found them right away. Oh, what do you know, Macy’s was (and still is until after today) having their VIP 25% off sale. The heels, which are the CARRSON, are $99 so with the VIP that’s about $25 off right there. I also remembered I still had $68 in rewards from Macy’s thanks for sharing program on a gift card. Deducted that. At check out it asked if I wanted to use my $9.60 in Plenti points, SURE! Oh let’s see, pick up in store to save $10 on shipping. What’s my total now… $2.06!!!!! 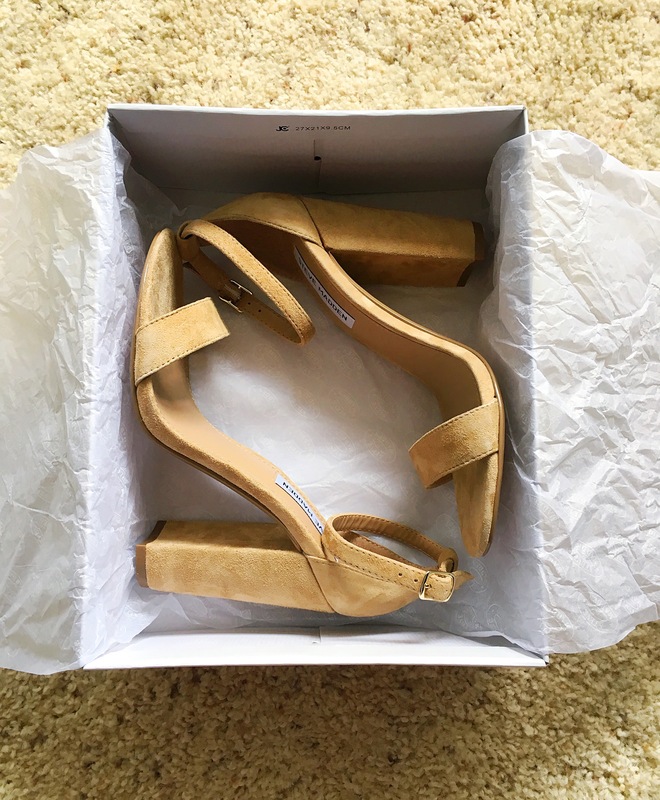 I got $99 heels for $2.06! The best deal I could probably have ever gotten. Please see how cute and worth it they are! Shop these Steve Madden CARROSON Ankle-Strap Dress Sandals from Macy’s here! I do not know why it took me so long to do another my favorite things but here is my second one finally. I will try to be better about this so I already have my next one planned! This set of favorite things is kind of an upgrade from my last one. If you missed it or can’t remember you can refresh your memory or catch up here. 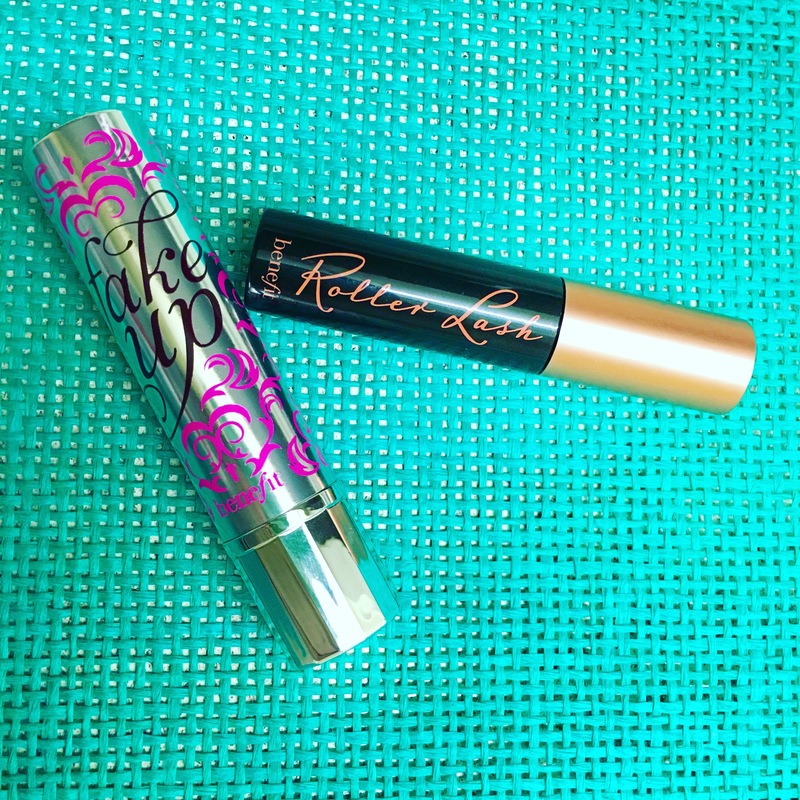 In my last favorite things post I shared my then new favorite mascara. 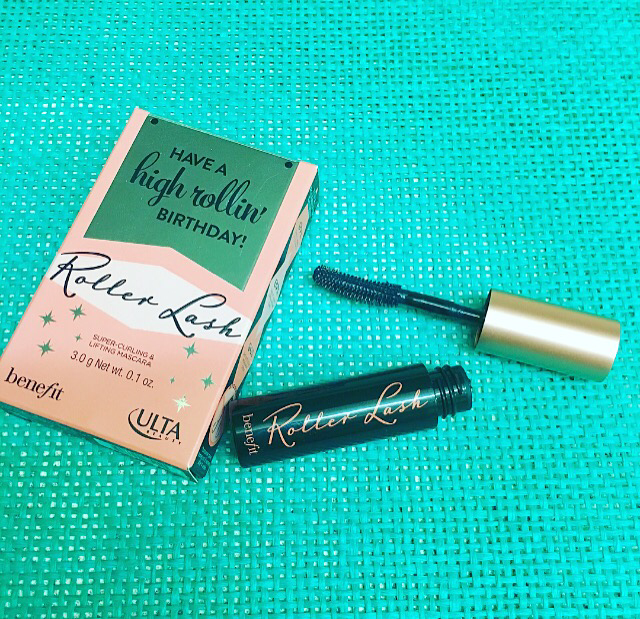 Well I have a new favorite and this one will be hard to top, Benefit Roller Lash Super Curling & Lifting Mascara. I got the sample size for free from Ulta for my birthday gift and let me tell you, this stuff is so amazing. The way the brush is made it grabs your lashes and curls them as you pull up. The first time I used it I was so amazed, it looked like I used an eyelash curler! (Writing blooper, as I was writing eyelash curler I wrote curling iron first- ouch that would hurt haha) Usually when I put mascara on I put a minimum of two coats on but most times three, and by coats I mean dipping the brush back in the bottle and applying another layer. After my first coat of the Roller Lash Mascara I was done. They looked perfect! I was going out though so I added another coat for good measure. But today, I wore it to work and only put on one coat and it looked like I had on my 2-3 layers of mascara. I can’t stop obsessing over it and I can’t wait to buy the full size tube. I HIGHLY recommend this mascara! 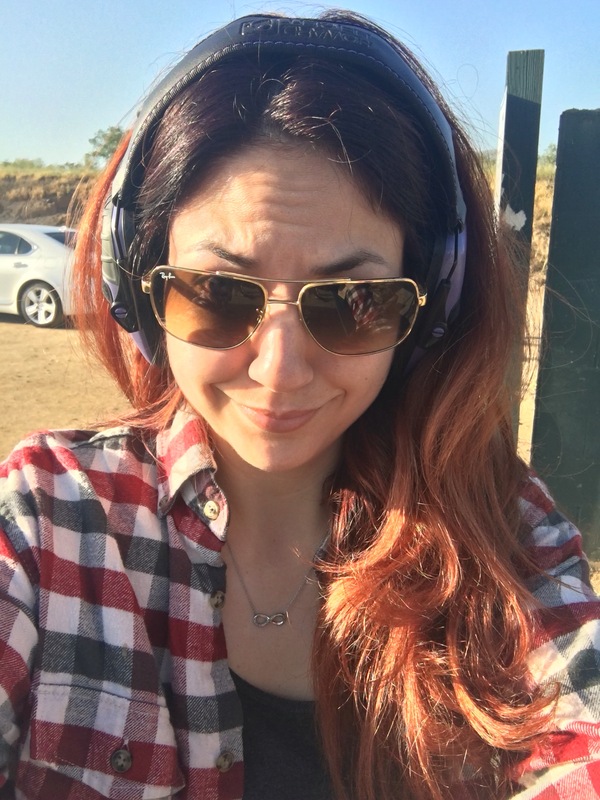 Again I apologize for not having before and after pictures but I just can’t take them, I feel like I look so ridiculous, I need someone else to take them for me. Shop Benefit’s Roller Lash Super Curling & Lifting Mascara here at Ulta! 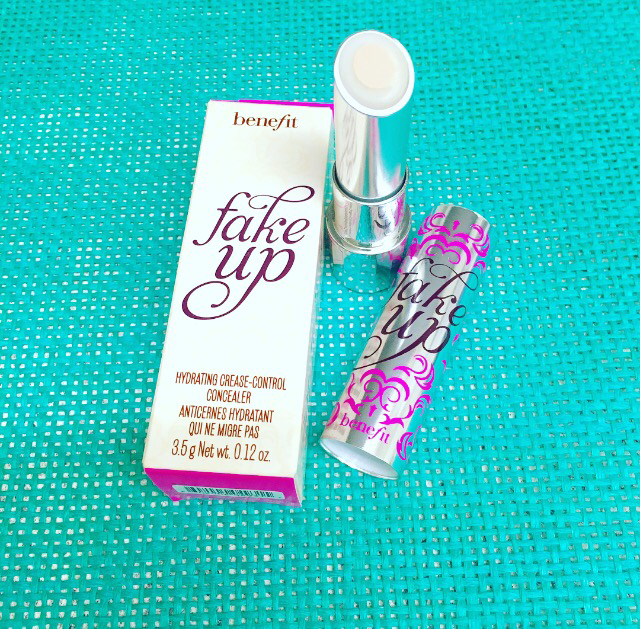 My other favorite right now is Benefit Fake-Up Hydrating Concealer. This is a crease control concealer that goes on under your eyes and is surrounded by a layer of moisture with vitamin E and apple seed extract. It goes on so light weight it is almost as if you’re not wearing anything and it stays on all day! I feel like I look so much more awake when I have this on even though I am so tired. Fake-Up Wake-Up! This is another product I highly recommend to try out! 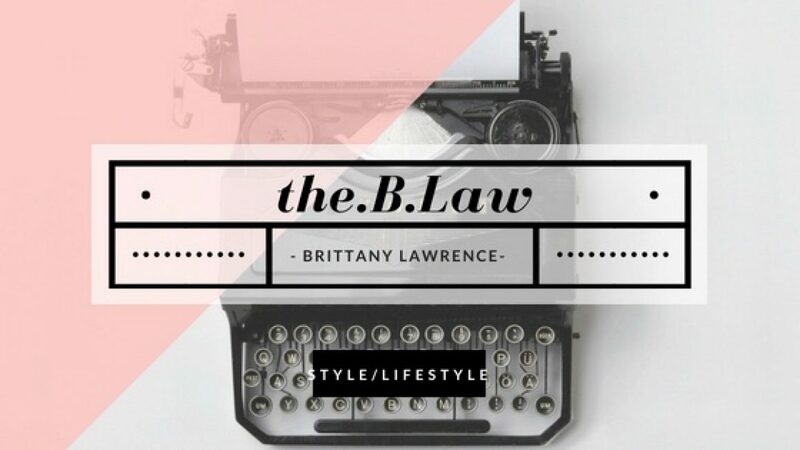 I actually found this from another blogger so I am passing it on again! Shop Benefit’s Fake-Up Hydrating Concealer here at Ulta! 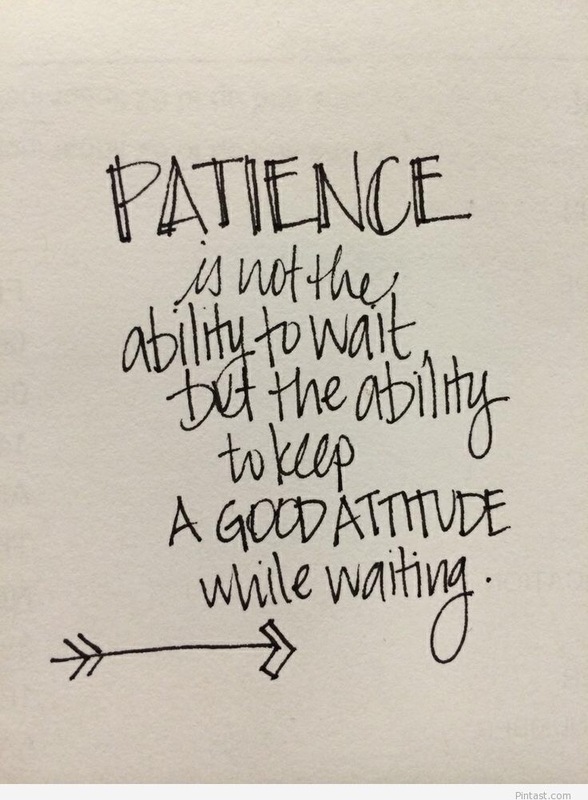 Lately I have really been realizing that I need to practice more patience. I seem to always be in a rush, even when I don’t have anywhere to be. For example, I was running a couple errands this afternoon and my last stop was Trader Joe’s. I got what I needed and was back in my car to go home, which is conveniently across the street. I backed out of my spot but couldn’t leave the aisle because this person pulled in on my side to swing in wide to a parking spot, which would have been fine except she was stopped and a guy was leaning in her passenger window talking to her and petting the dog in the front seat. I was instantly irritated because I couldn’t get out. I kept inching a little closer to make her get the picture that she needed to move. Finally she did and I drove by all frustrated just to wait in another line of cars being held up by someone else waiting to park. I was so angry, and then I thought, why am I so angry? The first lady who held me up was just being happy talking to a friend with her dog in the car. It is not like she was in my way on purpose, and the other car waiting to park, if I was waiting for a spot would I have not of done the same thing? I have always been busy and always in a rush to get somewhere on time. All through college I worked multiple jobs and was involved in greek life, and if I wasn’t working I had to be at an event. Even in high school I had a job and was a part of two different teams. Now that I only work a full time job with a regular 8-5 schedule, it is like I do not know how to slow down. This is something that I really need to work on. How much energy have I wasted on just being angry for people moving too slow? From now on I want to practice patience. I feel like having patience is one step closer to finding happiness. Don’t get me wrong, I am a very patient person, I just lack patience with other people who move slow (if that makes sense and doesn’t make me sound like a total jerk). I need to slow down, enjoy the moments, and have patience. Here is to a start, any tips or things that you do? Let me know! In my last post Patio Ideas I told you about my ideas for my patio, those ideas will go into effect next weekend when I actually get to paint my chairs. But until then, I made a minor upgrade to my kitchen table (which for those of you who have actually been to my place know that my kitchen table is no where near my kitchen but in my living room- I know it sounds strange but weirdly works? #apartmentlife). 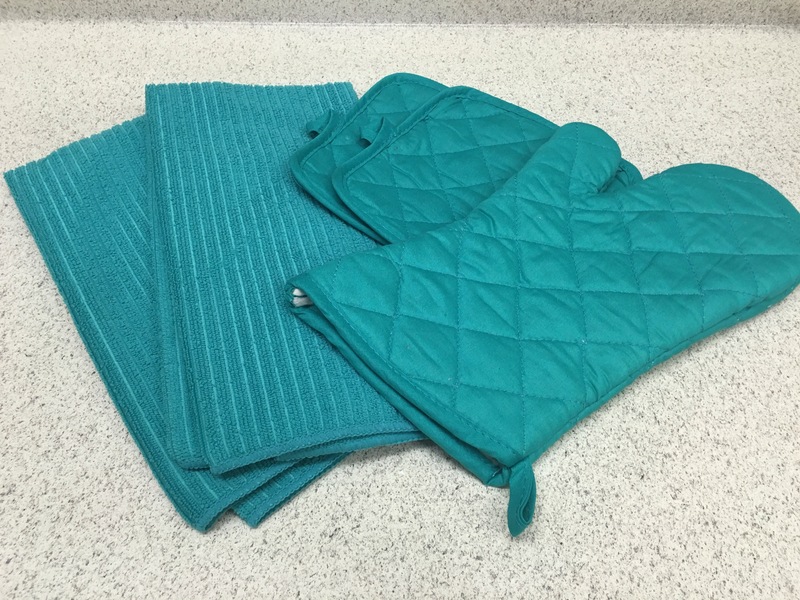 Anyways, I had bought new gray placemats and towels but hadn’t found gray oven mitts yet. I tried the Dollar Tree while I was out today and found these instead! They are much brighter in person but how cute are they?! 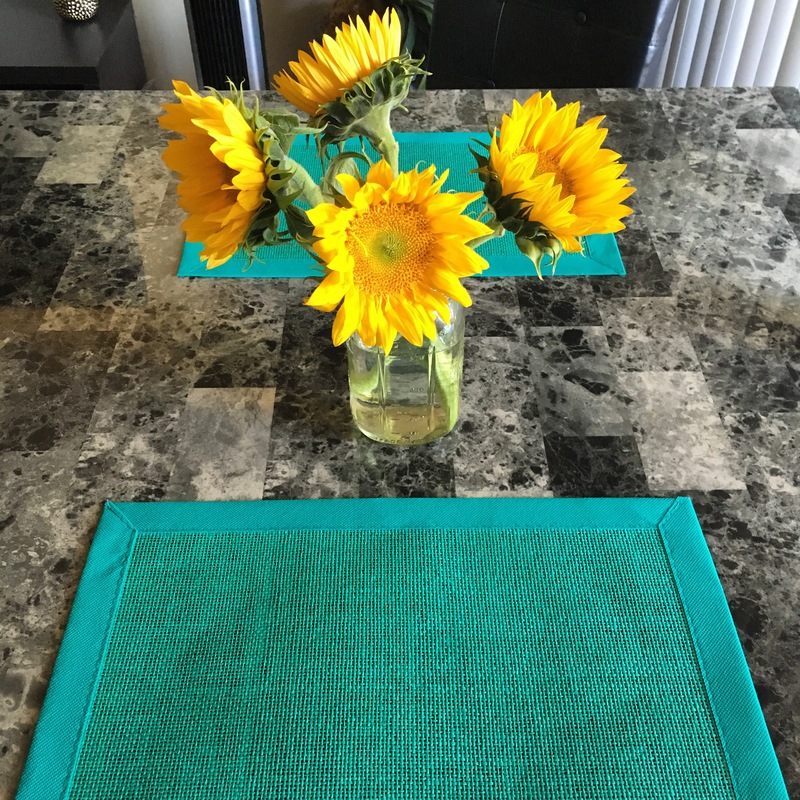 I even got matching placemats. So in all I spent $6 on two new place mats, two new dish towels, and 3 oven mitts. I go to the Dollar Tree for two reasons: One- I’m on a budget and why buy something for $5 when you can get them for $1? Am I right? Two- living with a boy who attempts to cook his way means a lot of ruined oven mitts. Like can’t you pull your frozen pizza out of the oven without getting melted cheese all over the oven mitt? Or please don’t lay your spoon covered in food on top of the oven mitt. See my point? If I get these cheap ones I don’t mind tossing them and getting new ones. I’m excited to slowly brighten things up for Spring so be sure to check back next weekend to see the patio! Also, thanks to Amanda at Glitter it Gold, I went to Trader Joes to find sunflowers and got these for $3.99!